L’Atelier restaurant welcomes guests throughout the day in its stylish dining room or on the covered terrace. A lilypad-clad pond and rice paddies in the foreground, majestic mountains in the distance. An idyllic setting for breakfast, lunch or dinner when staying in Luang Prabang. One of the only open-kitchen concepts in Luang Prabang! Next to The Junction, a few steps from the conference centre, the resort’s all-day restaurant is a hive of activity at mealtimes. 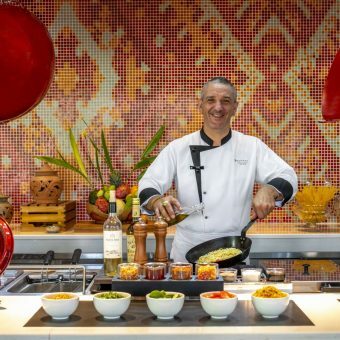 Chefs serve up fresh, innovative takes on breakfast favourites at live cooking stations. Ingredients are organic and locally-farmed. A la carte menus and buffets feature local and international delicacies. Full of daily surprises, designed with the help of nutritionists. Delivered directly to guest rooms and suites upon request. Marc Comparot likes to live life – and cook – outside the box. Innovative takes on traditional recipes have earned this French-born executive chef a stellar reputation across Asia. I fell into the hotel industry at a young age when a guidance counselor saw promise in my cooking skills. From pastry chef in Switzerland, I went on to learn the art of gastronomy at Accor hotels in Europe and Asia. It’s now been 25 years since I moved to Asia for the first time, and I’m still loving my life here. To me, cooking is a science. I love experimenting and transforming classic recipes with surprising ingredients. The fresher the better, and locally sourced whenever possible. The best ingredients come straight from the garden. My goal is to bring out the very best of each individual flavour, regardless of technique. Working with Pullman in Luang Prabang is a wonderful opportunity for my team. Having an open show kitchen adds a new dimension to our job, allowing us to meet with and get direct feedback from guests. We look forward to welcoming you to L’Atelier and hope you enjoy our fine contemporary blend of Asian and western cuisine.